Due to the new energy efficient standards, some of the bulbs you currently use in your home will no longer be available. Today, you have 3 choices of energy efficient light bulbs: halogen, compact fluorescent (CFL) or light emitting diode (LED). Each option allows you to enjoy the benefits of more efficient lighting without sacrificing the light quality you have come to expect from a Bulbrite product. If you are replacing a bulb that is being used in a tight space, check for bulb dimensions before buying a CFL or LED replacement. Some older variations have much larger dimensions than the bulb they are replacing. If dimmability is something you are looking for, halogen is the only technology which dims exactly like a traditional incandescent bulb. 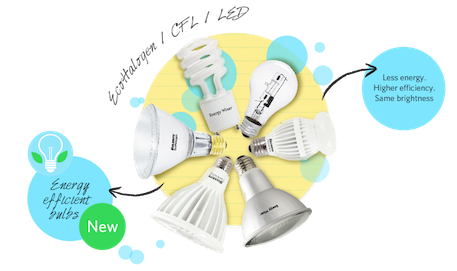 CFL and LED bulbs can be dimmable, but not all options are. 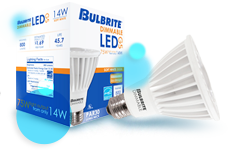 Check packaging for a "dimmable" icon or notation that indicates the bulb can be dimmed. You should also look for compatibility information for LEDs as performance may vary by dimmer and the number of lamps connected to any one dimmer. Calculate your ROI before making a decision based on price tags. Although Halogens are the cheapest alternative, they have shorter bulb life and therefore will require more replacements maintenance which can be costly. You can use our ROI calculator on Lightopedia by clicking here. If you like the warm glow of incandescent lighting, be sure to select a CFL or LED that also has a warm white light. In order to do so, check packaging for "CCT = Correlated Color Temperature" which indicates how warm or cool a light source is. The new “Lighting Facts Labels” (make this a link to FTC page) on bulb packaging shows you a scale from warm white light = 2700K to cool white light = 5000K so you can make the right choice. Another helpful tip when comparing light sources is to check for BRIGHTNESS! An easy way to do this is to check the “Lighting Facts Label” on bulb packaging which lists “Lumens”. “Lumens” is the measure of how bright a light source is and to pick an alternative with the right amount of light, you’ll need to know how many lumens your replacement requires. Still having a hard time finding the right alternative for you? Call or email us. At Bulbrite, we have a staff of American Lighting Association Certified specialists that can help you find the bulb you are looking for.